Shredding and confidential waste is an often overlooked cost centre. For Harpenden Building Society, their responsibility to maintain robust and secure systems to protect their customers’ data is one which is taken extremely seriously. However, as with all day-to-day operations, maintenance of regular procedures can become second nature. Spend can creep steadily up, often unknowingly and unnoticed. When Head of Operations, Phil Bannister, was recommended to contact Expense Reduction Analysts (ERA) by another well-known Building Society, he seized the opportunity to take some specialist advice on this crucial but often under prioritised business function. The results were staggering. 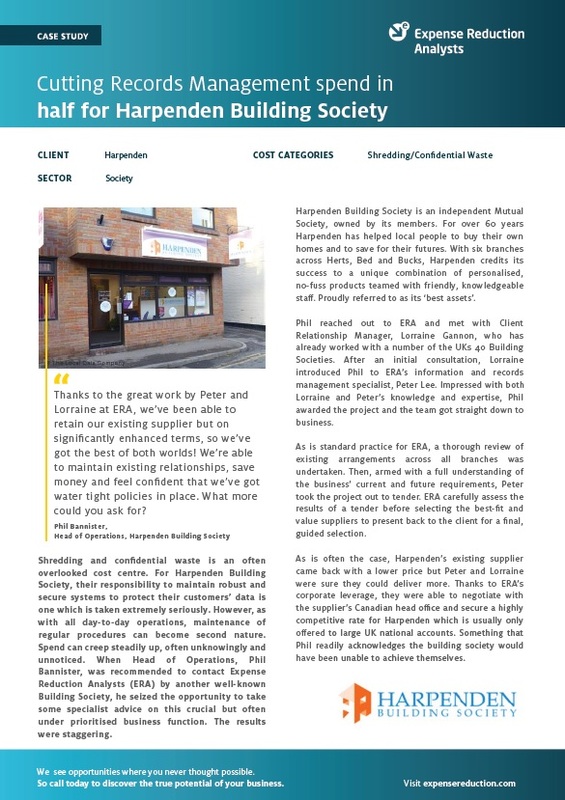 To find out more about how ERA helped Harpenden Building Society, including results, savings and more details from the client, download the full case study now.